NSD Therapy® offers the most efficient non-operative spine care that the world has ever own. Treatments are through the clinical efforts of Physiotherapists and Best Chiropractors. NSD Therapy® is not a single method of therapy, but rather a multi-pronged system that focuses on getting to the root cause of your condition for the best neck or the best back pain. Say goodbye to spinal surgery and useless injections that have killed or maimed many! It’s all natural means of care that fixes a slip-disc. NSD Therapy® makes it possible for a chiropractor or physiotherapist to fix even the severest neck pain and back pain without medication, spinal injections or spine surgery. Read more about indications for this non-surgical method of treatments. Neck and back pain are the most common health disorders in the world today. Back pain is the leading cause of disability in those under the age of 45 while neck pain is spreading like wildfire. Our modern lifestyle is impacting our health more than it ever did. The prolonged sitting (home, work, and car) coupled with the weak head and neck postures we get into while texting is the leading cause of neck pain and back pain and now disability! Get Your Neck Pain, Back Pain or Slipped Disc Repaired Without Surgery. NSD Therapy® is Enriched with Spine Specific Technology and Systems or care that Heals Back pain, Neck Pain, Nerve Pain and the Slipped Disc without Surgery or Injections. We Treat Pain With Technology! Opt for the BEST and Call us Now! Neck and back pain today is the crippling conditions affecting the young and old alike. Neck and back pain has many causes, pain resulting from a herniated or protruded spinal disc (Slipped Disc or Slip-Disc) is on the rise. Today, herniated, protruded or prolapsed disc (Slip-Disc or Slipped Disc) is at epidemic levels in which there is no immunity. Many procedures have come and gone, some helpful while others made things worse! The vast majority of treatments have neglected and often ignored the fact the human spine is a complex entity comprised of ligaments, muscles, discs, and joints. Hence, their approach often failed to produce long-lasting relief for those in pain. Due to the failures, some had to resort to invasive surgical procedures requiring cutting and throwing away (spine surgery) important body parts on more than one occasion. The traditional physiotherapy and chiropractic treatments rendered for those with a slipped disc have proven ineffective. How is this system of spine care better than Chiropractic and Physiotherapy? The traditional physiotherapy and chiropractic treatments rendered for those with a slipped disc have proven ineffective. As a result, the surgeons in most hospitals are busy performing spine surgery on patients with disc herniations and protrusions (slipped disc or Slip Disc). It is clear that the current forms of invasive and non-invasive treatments have failed to provide long-term relief for those suffering from neck, back pain and slipped disc. It is time for a change. The doctors want it. The therapists need it, and the patients are demanding it. A change to holistic corrective care instead of spinal surgery or those useless spinal injections. If you suffer from Slipped Disc, you deserve the best-slipped disc treatment: NSD Therapy®. Opt for the most advanced non-surgical spine treatment that fixes and repair disc damage. Let our experts help you reclaim your life. It was this need for change that ignited the passion of an expert team of doctors who understood the needs of patients and the shortfalls of current conservative treatments. They related that degenerated discs, bulging discs, herniated discs, sciatica and posterior facet syndrome were dangerous conditions, taking months and even years to develop. According to this expert team of doctors, correcting such long-standing conditions require expert knowledge along with a state-of-the-art facility properly equipped for the task. Through years of research, they provided practical step-by-step recommendations and guidelines for proper examinations, evaluations, and therapeutic procedures. These step-by-step protocols are all incorporated into our non-surgical decompression therapy procedures better known as the NSD Therapy®. It was specially created to assist physicians and healthcare providers in the non-surgical treatments of the spine. 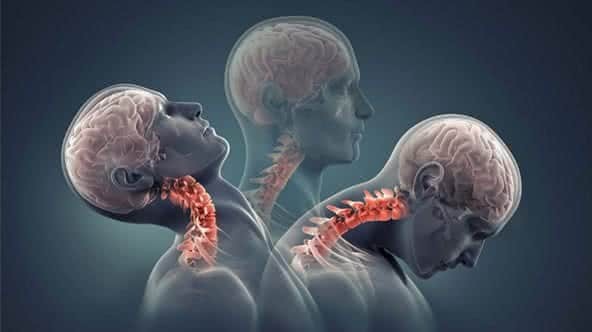 It includes evaluation, diagnostic and therapeutic procedures specific to the treatment of the neck and back. Making sure that the spinal muscles are free of damage (adhesions and scar tissue) and proper strength. If muscle damage or weakness is detected, then a series of therapies, both manual and through physiotherapeutic devices, are delivered to bring about positive changes. Also, a specific strengthening program is prepared for each patient for his or her condition. NSD Therapy® considers ligament health through specific procedures geared towards repairing and strengthening. Similar to muscles, specific manual, physiotherapeutic and strengthening programs are prepared based on patient condition and needs. Spinal discs are one of the most complex and most important anatomical structures in the human body. Today, the vast majority of spinal disorders are associated with disc malfunctions. Therefore, treatment of the spinal disc is at the heart of the NSD Therapy®. The goal is on rejuvenation, repairing, stabilizing, strengthening and maintenance. NSD Therapy® evaluation methods are utilized to see if there is nerve root compression as a result of related spinal disorders. If nerve root compression is detected, then a series of manual and highly advanced and highly specialized physiotherapeutic devices are utilized to take away, or at least minimize, the compressive effects on spinal nerves. 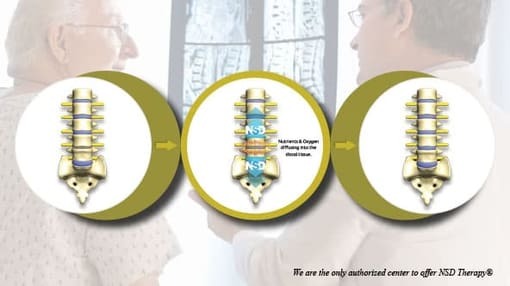 NSD Therapy® is the only form of non-surgical spinal decompression therapy through which clinicians are encouraged to consider patients’ age, weight, height, diagnosis, the severity of a condition, overall general health and much more prior giving them patient any treatments. Each treatment is unique from start to finish. Each session is customized, per patient, per condition. Additionally, patients are monitored for efficiency and response. Which Conditions Respond Best to This Method of Non-surgical Care? NSD Therapy® is for those who suffer from mechanical spine disorder as well as conditions listed above. It is the most holistic non-surgical method of spine care in the world today. NSD Therapy® is the world’s best slip-disc treatment option. Therapy requires continued collaboration between your chiropractor and your physiotherapist. Protocols of the therapy make it possible for you to get care from clinical chiropractors, best physiotherapists, and advanced technology. If you suffer from neck pain, back pain or a slipped disc; there is nothing better, as advanced or more holistic when compared to it. Why would one settle for spine surgery when they can have NSD Therapy®?